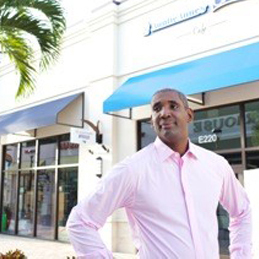 Former NBA player Mark Blount continues to be successful off the court while being a phenomenal small business owner and real estate investor. Having a professional basketball career for 10 years, Mark Blount has played center for the Miami Heat and the Boston Celtics, just to name a few. I was granted the opportunity to interview Mark Blount, a successful and brilliant young man who stands strong and tall. His heart of gold pours through many people, as he continues to give back to the community, assisting them in achieving their visions and goals. Here is what the business mogul, Mark Blount, had to share with readers during a recent interview with Consciousness Magazine regarding his career, as he shares valuable business tips and strategies. Aaron Robinson: What inspired you to want to become an entrepreneur? Mark Blount: After retirement, I just wanted to be able get into some businesses that I thought I could be successful at. I learned quite a bit from them. I didn’t have the background coming from the NBA to get into real-estate franchising. They proved to be very successful for me and I was able to grow and become an entrepreneur in my own way. Aaron: As a former NBA player, some athletes lose their investments, homes and material objects after or close to retirement. What do you believe separated you from going down this route? Mark: Well, I just think when it comes to athletes and regular everyday people, they get caught up in the stuff that’s around them…acquiring and buying things that are not good for their lifestyle. You acquire all of that stuff and it turns out to be more of a liability of having it. It makes destruct families and individuals. For me, it wasn’t more about acquiring things while I was playing. I was more so focusing on hard work and improving my craft every year to add something better to my game to help my team. Aaron: You came up with the concept, Blounts’s Business Triple Double concept which involves succeeding in 3 main categories, “Starting a Business”, “Growing a Business” and “Exiting a Business with Profits”. How did these concepts come about? Mark: [They came about by me] going through the everyday process of starting and figuring out what I was going to do and taking time to put the due diligence into the small businesses that I had. Then, being able to sell them and be successful and to move on and figure out what I wanted to do next. That’s where that whole concept of the Triple Double theme came from and also being able to share that with everybody. I thought that would be a good idea. Aaron: Mark, when starting a business, sometimes it’s challenging to get the word out about your business. What are some affordable and effective marketing approaches that you recommend for new business owners? Mark: Personally, once you find your passion and what you want to do, it’s about staying on the everyday task. I used my location area of being able to get the word out and also utilized the local media. Another aspect is adding a charitable cause to it - the holiday seasons or summer seasons - being able to bring traffic to my residential real-estate, making sure that people know that some of the funds are being used to not only help my business but also I’m giving back to the community. Aaron: I see it all the time where parents create a successful business and hand it over to their child or children and they don’t want it. Why do you think this is the case? Mark: It’s very hard sometimes. For the younger generation that is coming in, you don’t know if they’re going to make changes; you don’t know if they want to be there. They’re just there just lollygagging around and don’t have the passion for it. If they do, there would be changes. It will always be those complications there unless they really want to be into it and want to take over their family business. Aaron: What advice would you share for those individuals who have goals and vision, however lack the finances and resources to fulfill their business venture? Mark: Definitely take the time and understand what you are getting into. [Find out] how much it’s going to take financially; you may not see that. Make sure that you find the correct investors out there that can help you to make your business bloom. Be able to present to them your marketing plan and everything you need to get into the business. That would be the first step for them to do because a lot of small businesses fail because there are resources needed to help in continuing their performance to be successful. Aaron: Earlier you mentioned of ‘giving back to the community’. Mark, in 2012 you started an annual Thanksgiving Turkey Giveaway and you also created a organization called Seven Wellness where you bring fitness and nutrition awareness to underprivileged kids. What occurred in your life that encouraged you to service and give back to others? Mark: For me, just getting into basketball, understanding the game and what it took to get to the NBA, and understanding the level of determination and the process. I didn’t do it on my own, so I was able to start Seven Wellness. It’s very beneficial for low-income kids in the areas who don’t have the funds or the time from their families to do stuff like that in the summer time. I orchestrated a small camp and brought in some trainers and played different sports with them to make sure they understood the kind of food they need to put in their body to have the energy to play sports in school and everyday life. Aaron: Wow, that’s amazing! I love what you are doing for the community. I give you much love on that, for real! Mark: Thank you! I appreciate it! We all had people to help us along the way and mentored to us. When you are dealing with those different areas where they don’t get a chance to have opportunities and see different things, it definitely gives them a chance to do something different. Maybe if you can reach out to 10 or 20 of those kids, they will be able to do something for themselves later in life. Aaron: Before we conclude the interview, would you like to add anything that we haven’t discussed? Mark: Just put determination in your small business. And for small business owners looking to get out there and looking to start a business, make sure you are taking the time to understand what you are getting into. I think that’s the most important thing…the time that is needed. Aaron: Thanks a lot Mark. I really appreciate your time! Mark: Thank you! I appreciate the love!